The overall living conditions on some reservations have been cited as "comparable to the Third World." 85% of homes lack complete utilities. 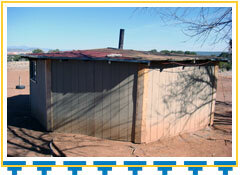 “A significant portion of the housing of the Navajo is in abysmal condition,” (Navajo Partnership for Housing, Inc.). The conditions of many homes pose safety hazards for the elderly residents. Navajo home before being repaired. 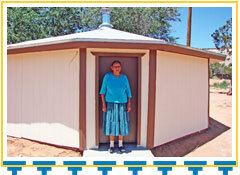 Navajo home after being repaired. 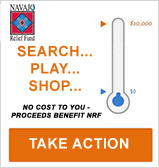 Homes of Elders are weatherized and made safer through NRF’s home repair service. Many of the structures we repair would be considered unlivable by most people. Through NRF’s Home Repair service, cracks in holes and walls are fixed. Roofs are repaired to minimize leaking. Insulation is installed to help keep warm air in during long cold winter nights. Seams around doors and windows are sealed to keep driving rain out during the spring and summer. Concrete floors have even been poured for residents who have only known a dirt floor.